Artist Inês Neto Dos Santos talked to me about her peculiar art, focusing on the power of food and gathering. 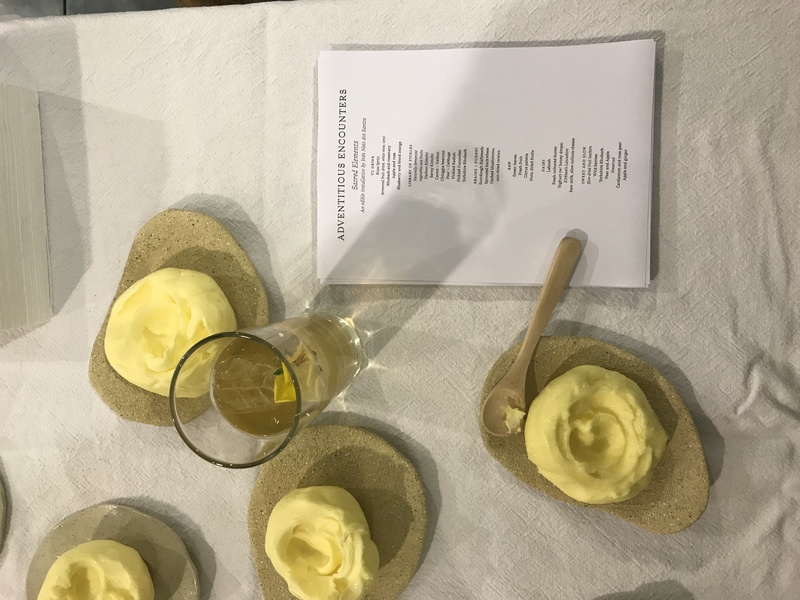 For the finissage of the exhibition Adventitious Encounters, held at Whitelys Shopping Centre, the artist presented one of her edible installations entitled Sacred Elements. Neto dos Santos is a Portuguese artist who recently graduated from the Royal College of Arts in London. She has always demonstrated a keen interest in the relation between human beings and the elements surrounding their daily lives. Her graduation project, for example, researched how the human body is connected with an environment. It explored both the physical nexus between our essence and the world around us, and the unconscious, emotional ties that bound us to nature. 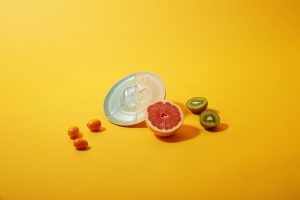 Recently the artist started focusing on food, thinking about it as a powerful and empowering element. Any dish, any ingredient tells a story, and speaks to a vast community. 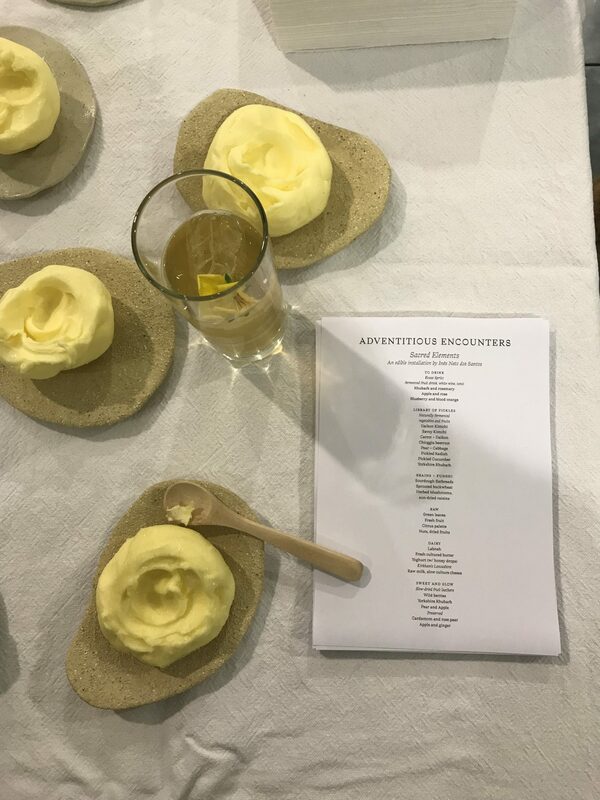 As Inês said, “food has the power of bringing people together.” The event she envisaged for the closing day of Adventious Encounters did exactly this: it unified people coming from different backgrounds, creating a new, temporal community, only thanks to the food they were sharing. In conversation with the works exposed for the exhibition curated by Anna Skladman and Huma Kabakç?, Inês’ elements also revolved around the powers of the universe and our response to them. Climbing up until the 4th floor of the Whitelys Shopping Centre, visitors found themselves surrounded by a maze of food, with pieces of some (amazing!) cheese hanging from a thin rope attached to the ceiling, as well as sun-dried tomatoes and slices of grapefruit. At the centre of the hall two white stacks presented lots of jars filled with fermented food and pickles. They came in all flavors and dimensions, ranging from long slices of pickled cucumber to kimchi, to sweet pear infused with cardamom. Next to them, a gauze containing a smooth labneh was coming down from the ceiling. 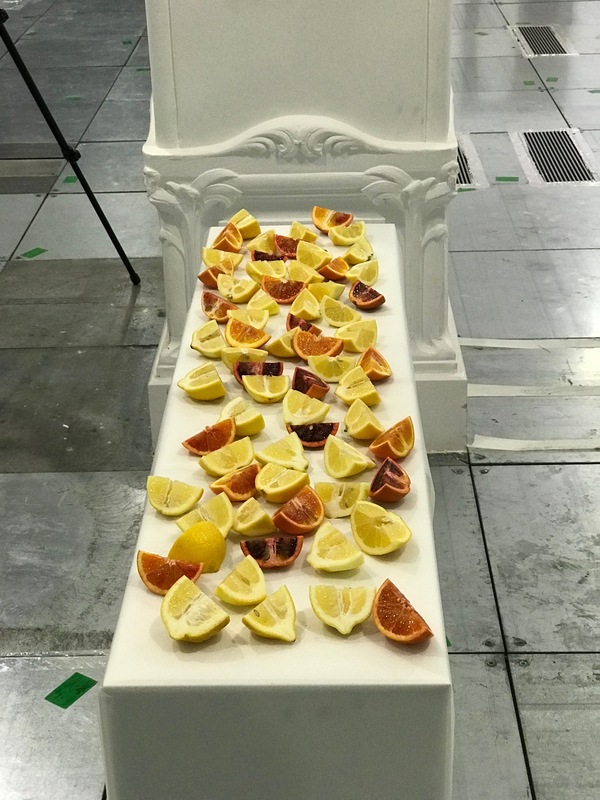 Finally, on two white benches slices of any sort of citrus were scattered around, as well as some joyful spirals made out of slow-dried fruit. (I am almost sure there were some strawberries, and definitely raspberries and other succulent …berries). When people started arriving, Ines was completing her creation. We found her seasoning her edible garden. She had, indeed, distributed on a raised platform on the ground some rocket mixed with corn salad. Sprinkled around there were herbed mushrooms, sun-dried raisins and almond. While people were already adventuring into the pandora vases with the pickles, Ines was enlivening her salad with a vinaigrette. The edible elements were composed with foods made using the four natural elements: water, air, sun and earth. As a full circle, unifying all component of the Earth, these Sacred Elements also unified all people together. 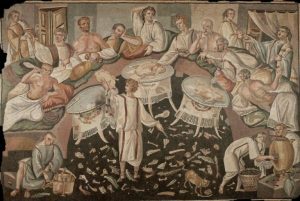 As Neto Dos Santos desired, the collective atmosphere created by this experience, based on the sharing of a meal, was peaceful and cooperative. 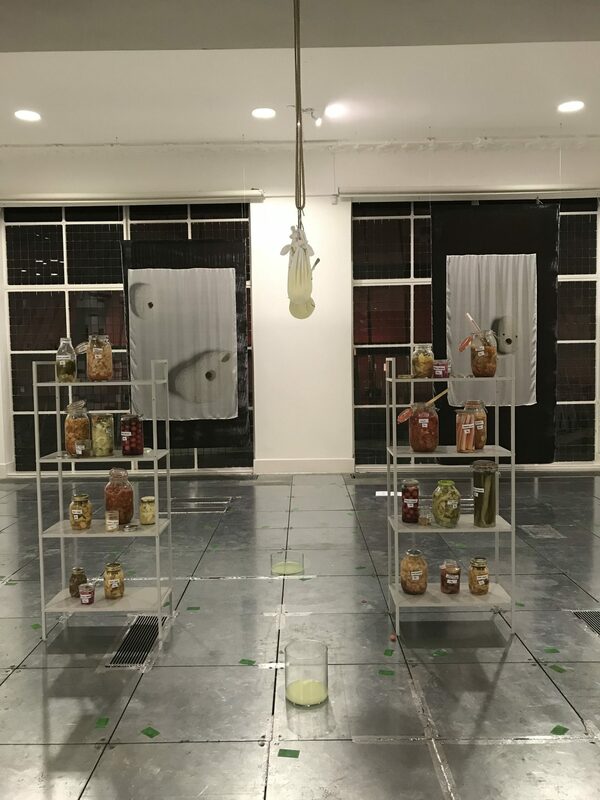 Here follows the interview with the artist, where she expands on the connection between Sacred Elements and Adventitious Encounters’ exhibition, and explains her concept of art and its relation to food. First of all, I would be curious to know what generated the event. How did you get the idea? How long did it take you to create it? Sacred Elements was an installation I created for the finissage of Adventitious Encounters, an exhibition held at Whiteleys Shopping Centre Skyroof. 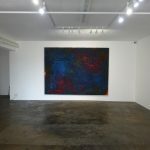 I was initially approached by one of the curators and started looking into the themes of the whole exhibition (which included around 20 artists!) to piece together my own work for it. Sacred Elements became a combined expression of my on-going research about natural food processes and the general theme of the show. Adventitious Encounters explored the relationship between nature, art and technology,investigating nature as an object of desire. 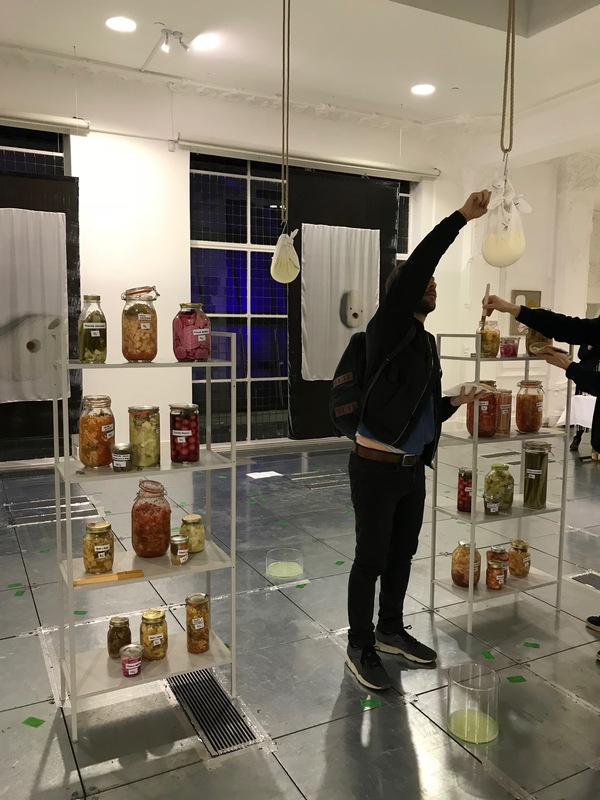 Within this, my piece explored food processes which used mainly or only the four natural elements (water, air, sun and earth) and the most important element of all, time. So I worked with pickles, ferments, sun-dried fruits and vegetables, as well as raw elements. Since fermentation and drying take time, I started working on it almost a month ahead of the event! Was the outcome what you expected? That’s always a tricky question to answer – working with site-specific installations, I can never really plan an outcome exactly. Particularly in my practice which relies a lot on the audience and its interaction. I generally feel accomplished when I see, feel or am part of new/interesting conversations with strangers (who later become friends, potentially! ), which derive from the work. That’s one of the main reasons I work with food: to generate discussion and togetherness. So in that regard, yes! How does Sacred Elements relate to your general art practice? I see my practice as something that moves between performance and installation, and stands upon collaboration and conversation. My mediums are food, people and spaces and I see these as tools I can use to question our surroundings and propose new exchanges and discussions. Food is such a basic part of our lives, something we all have in common in one way or another: it’s like a global language everyone can speak. Because of this, I see food as a tool with an incredible potential for driving change, empowering people and generating discussion. 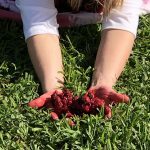 With Sacred Elements, these ideas were all there, alongside a desire to explore very ancient food techniques and see how they can potentially bring our bodies closer to the food we eat. Did you make all the pickles yourself? As well as the honey, labneh, pita and everything else? If you worked in conjunction with someone, how did you choose your collaborators? Yes, I made all the pickles myself, as well as the labneh, butter, yoghurt and the kvass! The sourdough flatbreads were freshly made that day by someone I’ve been working with for a long time: they are part of a business based on community values that I admire, as well as sourcing organic and local ingredients whenever possible. Similarly, the honey and the raw milk cheese were sourced from brands I am familiar with and whose processes and ethos I respect. I know that alongside your artistic practices you also worked as a chef. Can you tell me something about that? Where does your passion for food come from? How did it develop? 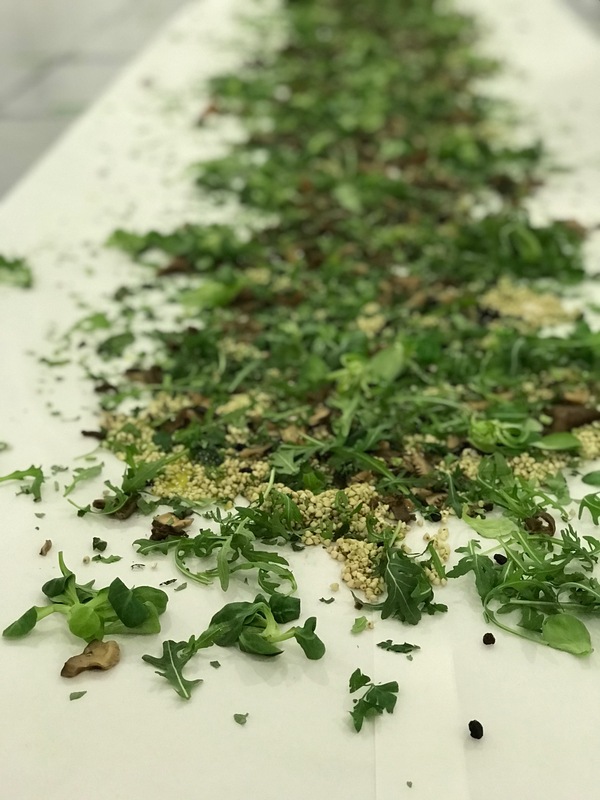 My work as an artist didn’t always involve food, but when I started putting the two things together, I started working as a chef on the side: to develop my skills and my understanding of ingredients and food processes. I’ve always been very connected with food: at home, the kitchen was where everyone gathered. When and why did you decide to connect your interest in food with art? I came to London to study art and design, not really thinking food would have anything to do with it. After a while, I started feeling like these two sides had to be connected…but for a long time I didn’t know how. During my Master’s degree I started organising monthly dinners, to bring together people from different departments under theme and start new conversations, exchange ideas and projects. As this grew and started involving more collaborations and moving outside academic walls, I began understanding the potential food has for togetherness, how it can be a tool for education, empowerment and making connections – and also started to be curious about how bringing food into the gallery space can challenge the exchanges between audience and artwork. So things grew from there! I came to London to study art and design, not really thinking food would have anything to do with it. After a while, I started feeling like these two sides had to be connected…but for a long time I didn’t know how. It wasn’t until I was halfway through my Master’s degree that I decided to just go for it and get something going: I started organising monthly dinners at my university, firstly to just bring together people from different courses and exchange ideas/projects and make new friends. It then grew into a collaborative project with fellow students and other artists and it has kept growing and changing ever since! I noticed that cheese, honey, fruit and vegetables are recurrent elements in your works. Is there a particular reason? I think they appear often in my work because they are such basic things which can be transformed into delicious concoctions without adding too much to them (provided they are of good quality to start with!). My favourite kind of dishes are often very simple things which use very few main ingredients…so I try to bring that into my work as well. Sometimes a good, hearty tomato with a pinch of salt and drizzle of olive oil is all you need to be transported somewhere else! You said that food brings with it empowerment. How does your practice relate to feminism? Do you consider yourself a feminist or do you believe this label has become outmoded? I believe food has a huge potential for empowerment: cooking can connect us to where we are, to who we are (or want to be!) and bring us closer to others. Through cooking, we can express emotions, thoughts, beliefs, culture – without having to say much. It’s so powerful precisely because it’s an intrinsic part of our day-to-day. Empowerment isn’t necessarily just a feminist premise, but I fundamentally believe in gender equality across the board – so I am a feminist for sure. Being a woman and working “in the kitchen” creates room for a lot of women’s issues to be discussed and brought up. I’ve been lucky enough to work with lots of inspiring female chefs along the way, amazing women who have taught me a lot of what I know today. On the other hand, I have also seen and experienced male dominance in professional kitchens and particularly the art world – which, along with issues in many other contexts, means the discussion on women’s rights certainly isn’t over yet. Your work, being in between a temporary installation and a performance depends largely on temporality and is somehow contingent to the specific moment and time it was created in. How do you relate to these questions of time, presence, uniqueness? Would you repeat any of your installation or do you consider them as site\time specific? If you consider ‘art’ to be the event itself, its preparation and its development through time, what is left when food is over and people have left? These are questions I ask myself daily! And they are things I am slowly understanding through making work. It can be difficult to deal with the fact that my work isn’t a permanent object which endures time…but it is hopefully an >experience or a conversation which stays within you. 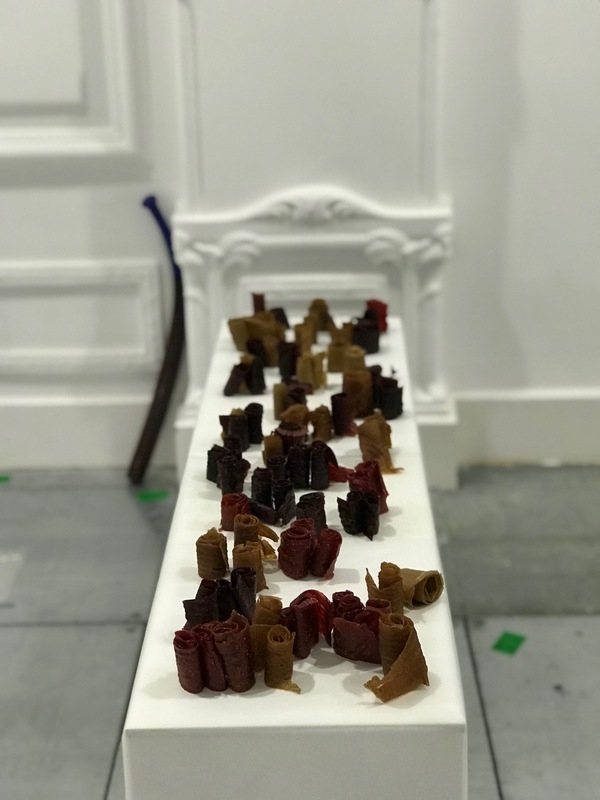 So after the food is over and people have left, they take part of the work with them – transformed, of course – and it somehow comes back to me in a different format. I have repeated installations and events, and although I applied the same concept/format to each repetition, the outcome is always slightly different. The people who exist within each work add things I couldn’t (and wouldn’t want to) control; and even if I am repeating something in the same space with the same elements, I tend to take on board whatever happened in the previous times and change small details. So the work is never completely the same, even if it’s repeated. This entry was posted in ART, INTERVIEWS, YOUNG ARTIST TO WATCH and tagged adventitious encounters, art and food, art with food, community, contemporary art, edible, edible art, emerging and young artists, Emerging art, event, exhibition, food, ines neto dos santos, Installation, London, london art news, nature, Open Space Contemporary, sacred elements, whitelys centre, young artist, Young artist to watch. Bookmark the permalink.